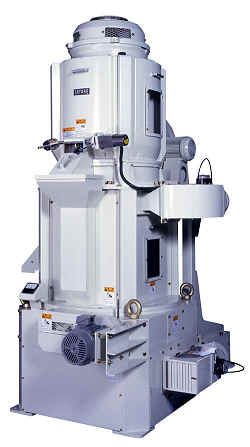 The Satake Debranning Machine VCW is the heart of the PeriTec Process. In the first stage the bran is removed by controlled abrasion and in the second stage friction polishes the grain and removes any adhering bran fragments. The PeriTec process, incorporating the Satake VCW Debranning Machine, provides products of superior quality at higher extraction rates, with less milling equipment on all wheat varieties. - An optional 'AutoWeight' load control device maintains debranning efficiency and prevents motor overload. Wheat enters the first chamber of the machine. This is the 'abrasion' section and contains a series of abrasive stones. Most of the bran removal work is performed by these stones. 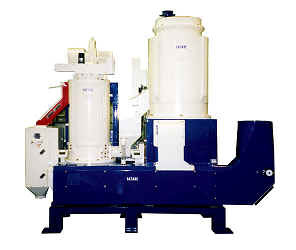 A weighted outlet gate controls the pressure in the milling chamber and hence regulates the percentage of bran removed. The second section of the machine is the 'friction' chamber. The wheat passes vertically up inside this chamber, polishing against itself, the roller and the screens. This polishing section removes dusty and adhering bran to give the wheat a better appearance and a cleaner consistency for onward processing.